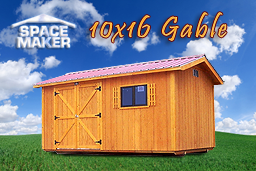 This building style is one of our most prestigious and gorgeous. You will be proud to use this storage in your backyard. Watch your neighbors as they start asking where you got that cool building! Pick your color or go with the clear coat, which really shows off the natural Western Fir beauty. 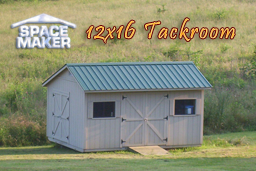 Traditionally used in Tennessee to store horse training and horse care equipment. 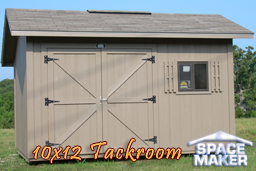 When storage in a small shed or in the barn is insufficient you'll need a Space Maker Portable tack room, meant for storage of all things. 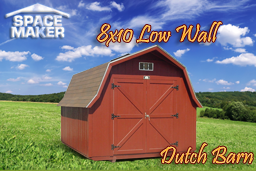 For a custom building that you can trust to be sturdy and long lasting, Space Maker Portable buidings feature flooring built on solid 4x6 pressure treated runners, and siding made from Western Fir with baked on primer to extend the life of the paint. 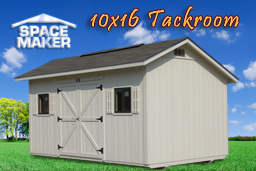 Available in several sizes and colors, our tack rooms are easy to install, and if these don't meet your needs, we also construct custom buildings based on your design needs. You'll have a space to store and clean up your garage, house or use it to store traditional horse riding and training equipment, while maintaining its beauty and quality in a safe, weatherproof building. 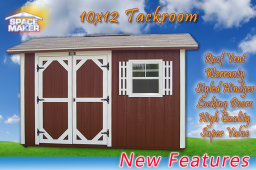 Classic 10x12 tack room is a perfect addition to your traditional land scape. Tackrooms fit small area with lots of space. 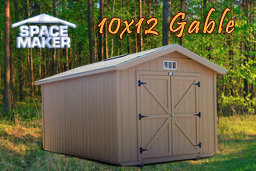 Storage large enough to move around in without taking up too much yard space. 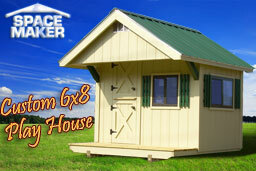 Our large tack rooms are portable and can be moved around using your tractor.